Vue 11 finally includes the ability to populate ecosystems on all sides of an objects (previously they could only grow "on the top" of an object). I immediately thought of Christmas lights. This is the same scene that I used for "Sleepwalkers" and "Sleepwalker Wood". Anyway, it was a bit more complicated than simply clicking a button but after much trial and error rendering (on my Asfaloth laptop no less) I think I am getting closer to happy. Just because upon viewing the images, it seems the lower 1/2 to 1/3 of the image is not rendered (fuzzy/foggy). Otherwise, the brighter yellow/white lights which look like those off the xmas tree--looks quite nice (~4/5). Sadly, in all versions just lok like little light balls attached to the trees, not actual lights. I have always enjoyed this background and the modifications of it for the seasons. I would have rated this higher but much like most of the lighting effects it seems to me like glowing circular bugs on a tree rather than a string of lights methodically placed. it does seem more natural from one perspective but unnatural for those of us whom have frequently seen Christmas light displays. Great wallpaper. This isn't a rating. I just couldn't find where to ask for another rsolution. Any chance you could pull off a 3840 x 2560 resolution. Your DB app on my nexus 10 says that is the resolution of my launcher. It would look awesome. Thanks. Matt - you can scroll down in the list - they are there. Ryan, can't find the Dual Screen version. When you click on the "Dual Screen:" image on the "Sleepwalker Woods (Winter/Night) (Christmas)" page, it brings you to the Dual Screen section, but it doesn't list the Christmas version, only the regular walkers version. Hope you can get it up there! Thanks!! I love this scene! It reminds me of a trip I was took to a cabin in New Mexico. 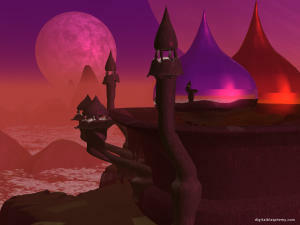 I am a huge fan and wanted to show my support by creating a 3d world out of this image you can check out what it would look like to walk through here: http://youtu.be/F-V_KitkA1M it was done on the fly and I intend on creating more with better depth and some more camera interaction. Thanks Ryan for all the inspiration you have given me these past few years! Strange! That file is on my server but for some reason my script is not generating the link. You can download it directly from here. Meant to say gets *it up. Not to imply he is sleeping on the job or anything lol! Same story for me. Hopefully Ryan sees our posts soon and gets up. I normally use the 2560x1024 Mutli Screen renders for my work computer and it seems to be missing on the "final" version. Is there a way that you can add it? I don't mind using the white light version of it, but I do enjoy the blue version too! "Mulit Screen Hidden Holiday Message?" I love the Sleepwalker Woods series, espcially the white and blue (blue being my favorite). As I have looked at dual screen versions over the past few days, I think I see a hidden message in the lower right hand corner in the trunk of the trees written in the 'reeds'. Are my eyes playing tricks on me? My vote goes to 'sleepwalkerwoodwinternight3'. I like the warmer tones, and clear focus. I agree with others before me though, each of the color variations has its own feel. Great job overall. That is my favorite too, but I would like to keep the colors as they are. Things tend to verge towards purple when I add more reds and greens to the mix. sleepwalkerwoodwinternightmixed4 is the best mixed one so far I think. I would really like to see it with a larger variety of colors. can there be versions of the pickle jar variations that dont have the middle of the image out of focus? "10 Love the different versions"
Great use of the Sleepwalker Woods. There's lots of variations to keep people happy with different versions. The Sleepwalker Woods I believe is one of your best works. So much has been done with it and every one of them has a different feel to it (even emotionally). Keep up the awesome work! I think a red/green Christmas variation would be fun...but maybe that's just me. "2560 x 1024 Multiscreen Missing"
Ryan please add when you have a moment. BTW my favorite is the blue. Your blues images are always the best go figure. Thanks and keep up the phenomenal work! I'm so glad you decided to go with the blue render. It is definitely my favorite version of Sleepwalker Woods and is easily one of my favorite overall wallpapers. would be nice in facebook timeline for seasonal changes! Just saying :) The blue makes me shiver, but the white has a lot of good color in the trees and ground. It has a warmer feel to it. The blue is cool, but the white is better. The white feels like it is mid day & the blue feels like it is in the evening. if that makes sense. this is stunning! definitely one of my favourites! "Love Your Work; How About..."
I really like the deep focus version and the blue version (since blue is my color). You always have a good Christmas wallpaper like this around the holidays. I especially like any of the ones at night with Christmas lights. To that end, I thought of suggesting to you that you do a Christmas village scene. You know, lighted (flame) lamp posts, wreathes and trees decorated and lighted, etc. Just a thought I hope you will give some serious weight! I'd love to see the one with a lot of red in a 2560x1024 version. Any chance you could animate the lights? THAT would be a cool christmas wallpaper! I love this setting, and all the color variations, there is preference for the deep focus as my eyes keep trying to fix the blur. You take my breath away. Your imagination is boundless and helps brighten this somewhat dingy corner of Britain. Love all of these, especially the blue. Thankyou. Also i like the one with the red and blue. My favorite one is the winternightblue2 also. You did a wonderful job. I am curious to know if another version could be done with a more varied amount of colors - red, orange, yellow, green, blue, and purple lights amongst the trees to make it look even more like a Christmas tree would. If not possible, that's okay as I really do love the winternightblue2 as I said ealier. I second (third?) the request for the multiscreens of the red and blue version. No big deal if this isn't possible, I have the in focus white in jumbo size, that's still my favourite. "What happened to white in-focus?" It's just gone? The only variations in the pickle jar are out of focus. White in-focus was my favorite by far, guess it's only going to be on my Desktop. The white version looks absolutely photo-realistic! People are crazy. The blue version is so monochromatic and cold compared to the warmer and more colorful "sleepwalkerwoodwinternight1". Most people seem to prefer the blue version of this scene so I will be featuring that one in my gallery. Thanks for helping me by rating the different renders in the Pickle Jar!! 2560x1440 for the mixed and lossless versions of that resolution for both for both of them please! Interesting variations, especially the last one (sleepwalkerwoodwinternightmixed1). I'd really like to see that one with more variety of colors (like adding green and yellow to the mix). "@Ryan RE: Missing Dual Screen"
can't wrap my head around the purple...yet!!! maybe it does need a bit of focus!!! "Thank You for the Variations"
The pickle jar variations on this are really great, Ryan. Thank you for rendering them for us. I'm using ChronoWall at the office, and these are going to round out the Christmas set very nicely. It's been a while since I last visited to look around, and I must say these renders are great. Love the purple, would really like it in focus. The blue is very nice too, and the original is stunning. Thank you so much for all the lovely work! Love them all, but to me blue is quitessentially winter, while multi is more Christmas. The red one is cool, but for some reason it reminded me of Hallowe'en... it's screaming out for the headless horseman riding through the tunnel. The blue is definitely pretty and common. I kept being drawn to the component colors of the purple. The purple was more interesting and fantastical. This version just feels like a winter night. This is wonderful. I can almost feel the snow falling quietly while walking under those lights. Awesome blue version. Immediately applied the multi-screen version to my desktops. The Christmas version is astounding... I love all the Christmas landscapes you've done but this one is really special. I'd give it a 10! .....how this piece has transcended from a scary, creepy site to a blue, bright, wonderful sight! thank for the focus change and this marvelous twist to an already spectacular work of art! "What about a multi-color, Christmas version?" "Missing Blue 2560x1024 (dual screen)"
The blue dual screen 2560x1024 seems to be missing. It would be great if you could track it down so that I could download it. :o) Thanks, Chris. Thank you! I live in AZ and miss the snow/lights every Christmas. This feels a little bit like home came to visit every time I sit down at my computer. "Never mind figured it out!" Never mind figured out how to get the facebook timeline of the blue version. Anyway to get a facebook timeline of the blue version? Love both of these. Thank you. Christmas spirit in a wallpaper. Love the idea. Prefer the blue version. Then again, blue and silver are my favorite Christmas colors. Love the blue one! Can't wait for the multi-screen! Love this! Both versions are beautiful. OMGosh The blue lights on this are amazing!!!!!!!!!!!!!!!!! It so puts me in the holiday spirit. I sure love this! Esspecially the Blue version! But they are all good! It would be interesting to see a variety of colors. Maybe something to think about for next year. ;-) Amazing as always! The blue version is nice (and we always appreciate options, of course), but I like the non-blue version much better. The blue multiscreen is rendering now. I should have it up before the end of the day. Glad you guys like it! Please do this one dual screen. I see you have the one for my laptop already. Could you do a dual screen of the blue version? I think this would be a wonderful Christmas card. It is beautiful! You nailed it on the last one. The first render looked a bit like a tilt shift miniature photo - didn't really work for the scene. OMG. that's gorgeous. jaw literally dropped. wow. Really like the dual 16:10 version cropped to a single screen. Makes it a bit darker and 10 for me. One of those that you have to question if it's a photograph or not. Perfect for the holidays. love love it. thanks! I actually don't like the yellowish hue, but I love it in black and white (ctrl+G in IrfanView). Granted I just like B&W photography, but it suits this art work so well. Outstanding. Thanks for the fix! It's perfect. Perfect for the winter season. Awesome. This is really a perfect wallpaper for the season! Especially as multi monitor! Looks real nice on my duals! Really get the wintery/christmas feeling!! Awesome. it looks great! Thank you for getting the size I need! Once we get a little closer to the holidays, I will be using this as my background. The dual-screen render is beautiful! Thanks again, Ryan, for your amazing work! Apologies! The 3360 x 1050 should be showing up now. One of the very best. Will be on every screen in the house for the next 6 weeks! They are actually luminescent spheres (built in Vue primatives). They only cast light through global illumination. Very cool render!!! What are those lights, Omnidirectionals? if so, DAMN!!!! This one is absolutely perfect. Thanks Ryan! I like this very much and fully expect to put the dual-monitor version into the rotation with my Chronowall setup here. Just kinda wondering what this scene would look like with more than just one color of light. Stop coming here for about a year, wasint feeling the wallpapers since got lured into interfacelift.com 1080i wallpaper. i had to check in to see your Christmas stuff. Would have given a 10 but it need more "hi-res" but i guess am just expecting more. Veeery Cool. Excellent for the season. Brings out the mood. Yep, it's a 10...and then some. The resolution is sharp, there's snow on the ground, and there are the Christmas lights! What could be more perfect than that! Just love it! Kudos! Ryan - the DOF in this is amazing and adds a great photo quality. My favorite Christmas scene you've done yet. My honest first word when I saw this in the email was "ooooooooooooooo". Love it. One of your best. There is actually some DOF blur in this image of course. The first two were set to "200%" blur but I dialed it back to 50% for the third version. I love it, it's absolutely beautiful. I like the fact that not all the trees have the same amount of lights or brightness, the variety seems more realistic. I wouldn't add anything, it's perfect just the way it is. Simple, clean, elegant. Love it. :) I like how it looks like there's just a bit of blur around the lights. I love Christmas lights, and this scene is amazing. Looks good. Only concern is the depth perspective on the lights. in particular there are a couple of trees in the back that appear too bright and concentrated. put gift boxes or footprints, something that will not take away from the scene. This latest version is so much better! The crispness makes the picture that much more beautiful, and my eyes are happier as they're no longer struggling against the depth-blur effect. Really good, I much prefer this latest version. Now I just need to wait for the multiscreen! How about some deer / snowman / something in the center, everything looks beautiful but a bit barren in the center! superb!! Thanks!! putting it on my desktop NOw! "Version 3 for the win!!" Thank you for version 3!!! Though all the versions are cool, the newest one (in focus) is the most appealing to my eye. The others may be more photographically accurate, but for a desktop, the sharper focus is nice. "All great, but like it best in focus"
I have to agree it is extremely difficult to tell this isn't a photograph. Thanks again for another truly inspiring image! It always amazes me that these aren't photographs... I have to look really closely and evaluate the minute details that "give away" the truth. For me, the depth of field blur was distracting, so I like the in-focus version better. This looks so real! It's totally awesome :) I agree with the others about a version with multi-colored lights. This is the version I've been waiting for! I like it so much better in complete focus. It looks like a photograph! I like having more in focus better. The Depth of field was too small on the original. I don't suggest rerendering, but if you were, you could blur the background of 3 a bit for effect. Version three absolutely does it for me! Id love to see the multi monito from Version 3! It just looks best!! I think this image is great. The depth of field and the bokeh is lovely. It's simple. It's sharp. It's exciting. I love the DoF. I dunno why people are picky about it. Very artistic and very good! Maybe drop a Christmas tree at the end of the tunnel- as if you were heading down a rural street towards the city center? That might give it the focus needed - but would require a reversing of the blur with the focus in the center and blur around the edges. Love it! Multi screen renders on these last ones Pleeeeeeease!! Holy crap, this has to be a multi-monitor wallpaper, Ryan!!! :) I can't wait to put this on my work and home computers, my iPhone, and anywhere else I can get away with! I absolutely love this. Both renders are beautiful. Have you ever considered doing something Thanksgiving related? Genius! This looks like a photograph, really! 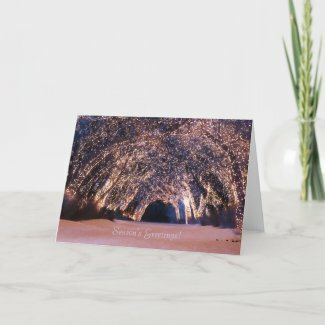 I love how you made it look like that... because you have the focus in the foreground where we can really see the tree limbs, lights, and dead grasses focused and the background blurry. Just as you would with a camera set up to photograph the scene that way! Awesome! I'm currently using a 13-in MacBook Pro, and wish there was a 1280x800 render. Other than that, I still love this one. Definitely better, though the blurry part still bugs me a tiny bit. Keep it up! Please! My monitors have jealousy issues so I can't use this until I get a dual-screen render. Its amazing, but the focus shofted to the center of towards the end would make it spectacular 10/10. Is it possible to dial back the DOF? I agree with the others who have mentioned that it is a little too blurry. Outside of that, though, it looks amazing! Agree with others that has great potential. The blur is too much. It literally bothers my eyes. The lights on the trees do look amazing. Love it as it is! I live in a area that does extreme lighting of their tress in the downtown. A photographer took a picture similar to this and there is no way of telling that your computer render is not a real life photo when compared. My friends and colleagues have always gasped to find that some of my desktop backgrounds, your work, were in fact not real world photos. As always I am amazed at what you can create Ryan!! When I saw this as a thumbnail on my phone I thought this looked awesome. However, when I see it in full my eyes struggle with the centre not being in focus. If you can think of a way to fix it then it'll be a ten for sure. Wow.. I wasn't a fan of the white winter version, but this is amazing. The lights illuminating the snow is perfect. The idea is great.. Its just a little to much! The Focus is also distracing..
Nice feature, and nice result too. I don't know what to say about the focus exclusively on the foreground. I am not used to see that. Can we please get a multi-screen render ot it ? I like the idea but it's just too much. I find the point of focus a little distracting, and the lights are too many and too much. Less (well, fewer) would be more here. I agree with both "focus is distracting" and "too many lights". I think reducing the number of lights would allow you to move the focus back and not overwhelm the scene. I absolutely love this one, though I do agree with others that the out of focus background is a bit distracting. Other than that, it is quite lovely, and currently being used as my background. The only thing is, when will these newest wallpapers be available for the 1920x1080 single screen Zip file download? I am not a fan of the tight focus. The background blur is sort of distracting. Just an aside, I think I am permanently creeped out by this scene, in all it's forms, because of the zombie version! A little *too* much lights? And its too out-of-focus for my taste. Too heavy-handed and the wow factor's lost. I never thought I'd say this, but there's actually too much bling. If the lights were dialed back by, say, 25-33%, I think that'd about do it. I'm a fan too of hidden lights -- I like the ambience of lights you can only see the effect of, not the light itself. :shrug: That's my two cents anyway. They're probably worth about as much. Christmas is my favorite holiday and I love all things Christmas lights. :) I am instantly drawn to this holiday version of the Sleepwalker Woods, but something about the focus bothers my eyes. I don't have suggestions about how to fix it, but I look forward to a "tweaked" version. Very nice, though I would like to see a little bit more focus and I also wouldn't mind seeing other color variations for the lights. Where is the 1080p res? Where is the iPad 4 screen size? Artistically I love it and I would probably take a similar photo; but I don't think it's one that would get chosen by people looking at them. I like that it messes with your vision... My eyes are drawn up to the top where the branches overlap, I think you need an "Easter Egg" in your Christmas Picture or something to focus on, even if it is out of focus itself. I love it! Its so cheery! Certainly the best Christmas wallpaper in a very long time. I was thinking it would be really neat if you could do a similar wallpaper, but instead of a trees in a forest, it'd be trees in a town (like an old town sort of area). 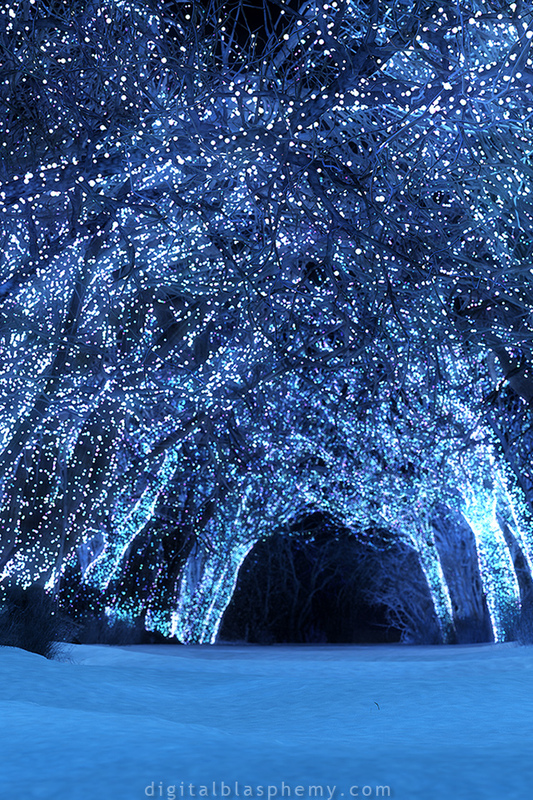 Theres a place like that near here and its always so warming to see their christmas lights. Love it, Ryan! 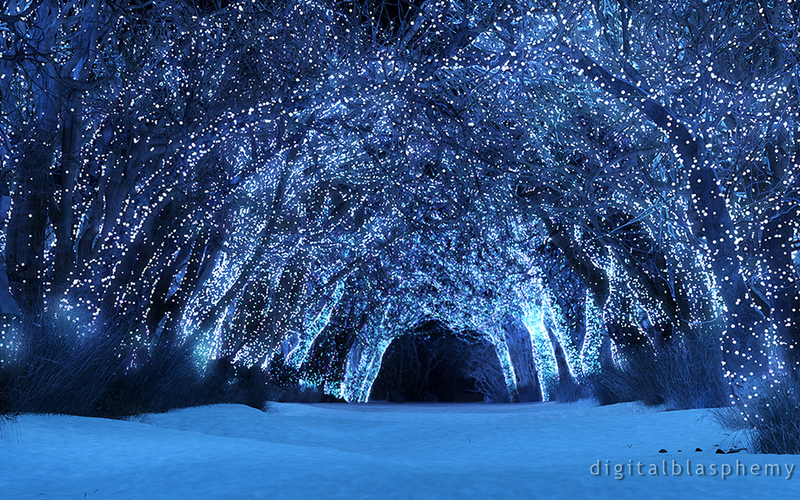 I've always been a fan of your nighttime/winter/christmas wallpapers, and this has got to be one of my favorites. Maybe throw full focus in the pickle jar? This is brilliant though. Ryan, this is crazy good. With the added lighting the lens focus effect really shines (no pun intended!). would you play with the focal point a bit and see how it looks placed in the middle of the woods, rather than right up front? This one is going to be in the top 3 I think! This is an awesome Christmas wallpaper. However if I had one complaint it would be that the Christmas lights blur as you look further down the tunnel. And I love the idea of colored lights or maybe blue that someone on here suggested. The snow looks so realistic as do the trees. Great job Ryan!!! "Where are the triple screens!?" Looking very very cool. Your Christmas wallpapers are always some of my favorites. Looks very realistic. I do have to wonder what it would look like with multi-colored lights as well. an additional note - if there were something else in the foreground that my eyes would be able to focus on, not just the edges with the trees, my eyes would be much happier. Currently, because the bulk of the in-focus stuff is on the sides, my eyes are drawn to the center, to the distance, meaning I'm trying to pull *that* into focus. Also, if there were fewer lights on the unfocused trees, the focused trees would "pop" more, also drawing the eyes. Very seasonal, great perspective, use of the fuzzy and clear. The lights blur at the right points, especially in the distance. It's good. Very photo-realistic, BUT very "busy" as you yourself put it. The middle distance has far too many lights, especially on the left-hand side, in my honest opinion. Perhaps another render using about half the amount? I could see this as being part of a scene described in a fantasy novel, where the travel weary characters come across a moment of wonder, before having to continue their mundane journey. I felt the scene looked a bit too busy (for use as a wallpaper) when everything was in focus. Very nice! Not sure what I think of just how tight the focus is, but the overall effect is good.